​Harvard School of Dental Medicine Dean R. Bruce Donoff jokes that his biggest accomplishment is making 80 percent of the University aware his school exists. Dean Bruce Donoff of the Harvard Dental School poses for a photograph in his Longwood Medical Area office. Harvard School of Dental Medicine Dean R. Bruce Donoff jokes that his biggest accomplishment is making 80 percent of the University aware his school exists. With just 240 total students, the Dental School boasts a much lower enrollment than the majority of Harvard’s other professional schools—and many other dental schools. The school graduates 35 D.M.D.s per year, a number smaller than the graduating classes at many American high schools. 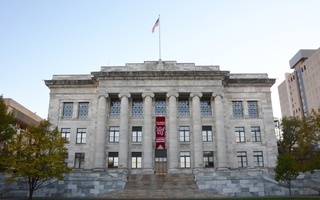 The school also has a small physical footprint, occupying just two buildings in the shadow of the Harvard Medical School, located in Longwood, Mass. But despite his school’s diminutive size and relatively low profile, Donoff is himself a Harvard fixture. He can claim one of the longest tenures of any current dean of Harvard’s twelve schools. 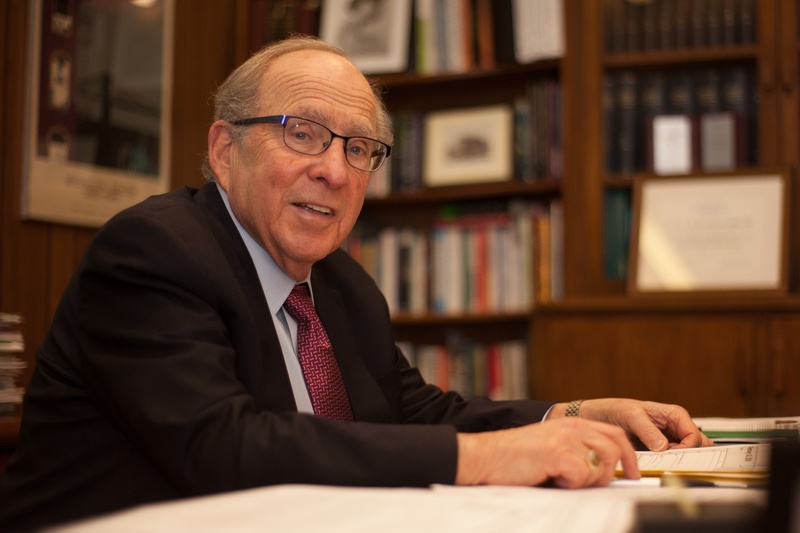 From his spacious office overlooking Longwood Avenue in Boston, Donoff—who became dean in 1991—looks back on nearly three decades at the helm of one of Harvard’s smallest schools. He has seen thousands of students pass through campus to earn D.M.D. degrees across the years. Donoff has also guided the Dental School through the tenures of three Harvard presidents, groundswell shifts in how dentistry is taught, and, most recently, a successful capital campaign. Throughout these changes, colleagues and friends say he has remained committed to his core priorities: education, research, and care. Donoff grew up in Brooklyn, New York, where he graduated from Brooklyn College with a chemistry degree in 1963. He came to Harvard, earning a D.M.D. from the Dental School in 1967 and an M.D. from the Medical School in 1973. Donoff said he found Harvard attractive because of its integration of dentistry and medicine—dental students spend a substantial part of their time on campus taking classes at the Medical School. While he was studying at Harvard, Donoff chose to specialize in oral and maxillofacial surgery, participating in a then-pilot program that sought to combine general and oral surgery. Donoff said this program has since inspired 60 similar initiatives across the country. “Harvard has that ability to develop programs that might be of benefit in a more general way,” he said. After completing his residency, Donoff rose through the ranks of the Dental School faculty—and all the way to the deanship. On the way, he also served a decade as chief of service for oral and maxillofacial surgery at Massachusetts General Hospital, where he continues to accept new patients. One of Donoff’s major projects as dean involved the 2000s-era construction of the new Research and Education Building at the Dental School, completed during Lawrence H. Summers’s time as University President. Donoff says the building doubled the school’s size. Even now, as he approaches the third decade of his deanship, Donoff continues to stay very actively involved in the school’s day-to-day operations. For the last two years, Donoff has served on the admissions committee at the Dental School. The school receives nearly a thousand applications each year, according to the 2016 dean’s report. As dean of the Dental School, Donoff said one of his foremost priorities has been the integration of oral and general medicine. Jane R. Barrow, associate dean for global and community health at the Dental School, said she returned to the Dental School from another position at Harvard at Donoff’s request in order to help bring together oral health and primary care. “I thought that he had a very unique perspective on oral health and how it fits into overall health and medicine,” she said. The school’s “Initiative to Integrate Oral Health and Medicine” was established in 2014. It aims to “fully integrate oral health into health care education, delivery and financing,” according to the initiative’s website. Early corporate supporters include Colgate-Palmolive, Philips Oral Healthcare, and insurance company DentaQuest. “Our vision is to break down barriers between dental health and general health,” Donoff said. The initiative’s research has found that investments in oral health can reduce primary care costs significantly by keeping chronic illnesses at bay, according to Donoff. Chloe A. Wong, a fourth-year student at the Dental School, said Donoff’s desire to merge dental and general health positively affects students’ experiences at the school. “His philosophy has trickled into how we learn dentistry, what dentistry means, and how to practice it in the future,” she said. The school’s newly redesigned “Pathways” curriculum exhibits this philosophy. It also includes a move from lecture-based instruction to hands-on and virtual learning. “We added some early rotations in hospital-based programs, like oral and maxillofacial surgery, oral medicine, [and] pediatric dentistry,” Donoff said. Donoff has been at the Dental School for nearly his entire professional career. People who know him well, though, say he has not changed—he has remained committed to helping students and advancing dental education generally. Donoff’s colleagues say the dean is accessible to students and devoted to their success. “He has a very open-door policy. My impression and belief is that the students feel comfortable going into see him and telling him what’s on their minds,” Barrow said. Vice Dean of the Dental School John Da Silva said he first met Donoff in the 1980s, when Da Silva was a Harvard dental student training at Massachusetts General Hospital. “He was very student-centric. I mean, he really was interested in making sure that when we there as students at the hospital, that we had a chance to see and do things,” Da Silva said. Barrow particularly pointed to daily afternoon teas at the dental school as an example of the dean’s willingness to mingle with students on a regular basis. Donoff himself also said the Dental School’s “community-oriented” nature sets it apart from other institutions. “It’s a very special place,” he said. And Donoff seems to have no plans to leave it. Instead, Donoff is looking toward the incipient tenure of the University’s 29th president, Lawrence S. Bacow. Bacow, a member of the Harvard Corporation—the University’s highest governing body—will take office in July 2018 after current President Drew G. Faust steps down. Donoff said he is broadly confident in Bacow’s ability to lead Harvard across the next several years. During Bacow’s time on the Corporation, he was assigned to particularly focus on the Dental and Medical schools, Donoff said. “He exhibited the kind of qualities that I think epitomize good leadership: He listened, he was humble, he asked good questions, he was interested in students,” Donoff said. The dean said he recommended Bacow as a potential president to the Board of Overseers last fall. Donoff identified funding and budgetary issues as among the biggest challenges Harvard’s next president will face. Last year, Congress passed an endowment tax that would have cost the University $43 million if it had been in place in fiscal year 2017, and President Trump has proposed deep cuts to research funding. Still, Donoff said he is optimistic about Bacow’s ability to surmount these hurdles. If history is any indication, Donoff will be there to see it. —Staff writer Luke W. Vrotsos can be reached at luke.vrotsos@thecrimson.com. Follow him on Twitter at luke_vrotsos. We learn that the great university of Berlin is preparing to add a department in dentistry to its other courses.